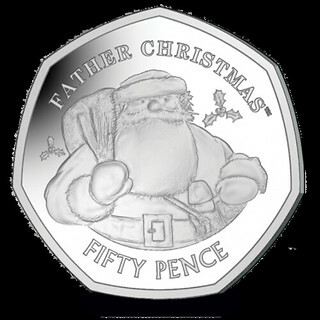 The Pobjoy Mint will issue a Christmas 50p coin for Gibraltar. 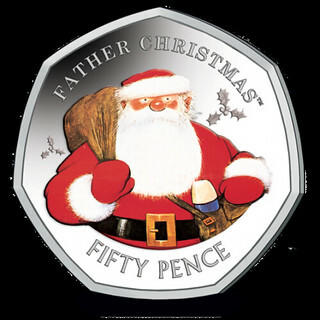 The coin will depict Father Christmas as drawn by Raymond Briggs. The design. The coin is available in both colour and non colour and comes in a special packaging. The website has completely crashed. The total mintage is 7,500 pieces. That includes both the coloured and non coloured coins. Looks like the coloured one has sold out already. Pobjoy Mint releases the coins in batches so it is possible they just have to restock it. We will only know if it is sold out when they confirm this. A limited amount of these coins will be available after lunch today. People who still like to buy them will have to be quick as only few pieces are left. 20,000 pieces will be released into circulation in Gibraltar. The coin is now also available in silver proof (normal weight) and gold exclusively from Harrington & Byrne.